We love animal rescue stories, and who doesn’t love it when the hero is also an animal? Champ is a wild Mustang stallion that lives in the Tonto National Forest in Arizona with his herd. 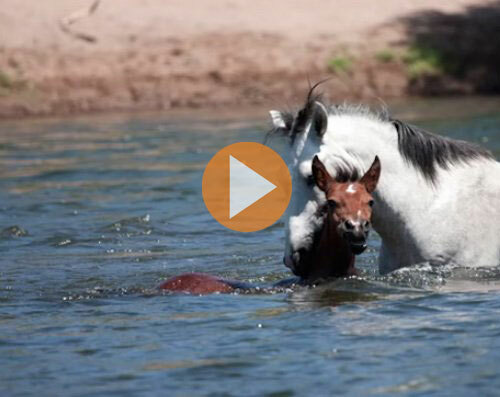 He and his family were interacting with another herd in the Salt River when one of Champ’s fillies loses her footing and starts to get washed down the river. The proud stallion came to her rescue and Becky Standridge, a Park Service volunteer, was on hand to capture the remarkable moment on film. Watch the drama unfold in this lovely photo montage. When a wild raven perched on Gertie Cleary’s fence and squawked at her for over an hour, she approached the unhappy bird and discovered it had porcupine quills lodged in its face. The bird, clearly in pain, sat patiently and waited for Cleary to get each of the quills out, complaining each time but not moving, just like a child having a painful splinter removed. Cleary told CTV News she didn’t think twice about helping the animal in distress. The family named the bird Wilfred and he hung around for another day before leaving. Hope Swinimer, the founder and director of Hope for Wildlife, says Cleary likely saved the raven’s life. 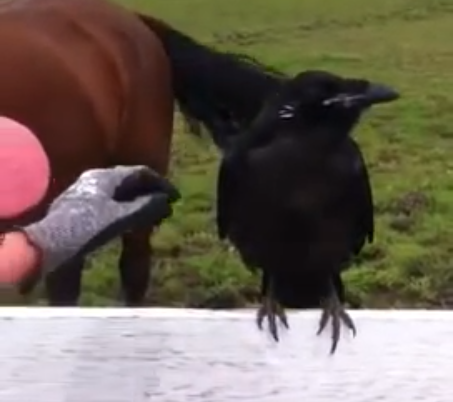 Ravens have some of the largest brains of any bird species. They display ability in problem solving, as well as other cognitive processes such as imitation and insight. Looks like Wilfred knew where to go for help when he needed it.